The Mississippi Gulf Resort Classic is a golf tournament on the Champions Tour. It was played for the first time in 2010 at the Fallen Oak course in Biloxi, Mississippi. 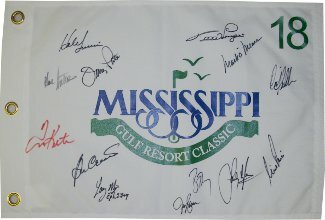 This White 19x13 Flag is hand signed by 13 golfers including: Hale Irwin, Craig Stadler, Tom Kite, Ben Crenshaw, Bernhard Langer, Nick Price, Jeff Sluman, Sandy Lyle, Larry Mize, Mark O'Meara, Hal Sutton, Bob Tway, Jerry Pate. Beckett Authentication Services Hologram and Full Letter of Authenticity.